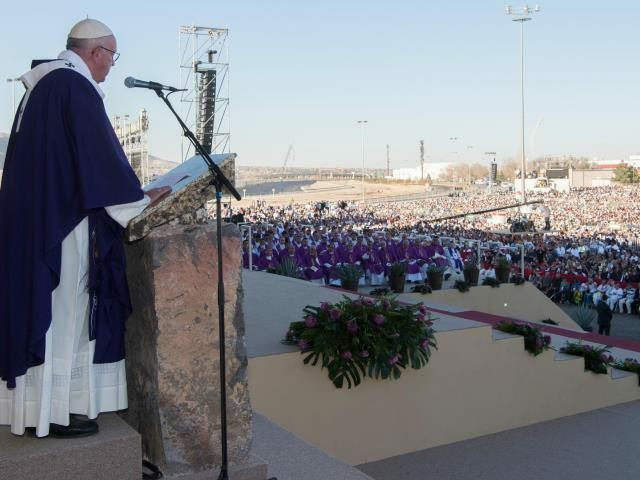 His prayers and the Mass were also telecast live at the Sun Bowl stadium in El Paso on the Texas side of the border. The crosses and the site of the Pope praying there, were intended as a powerful visual to be etched not only in the minds of those in attendance, but memorialized for world history in photographs. The spiritual leader of the world’s largest organized religious institution addressed government officials and others about their openness to immigration. The message was meant to educate, and to serve as a reminder to the thousands who have died trying to make the journey into the United States. Indeed, thousands have died trying to swim the Rio Grande river, by taking the journey in the heat and treacherous sand, and by putting their lives and their futures into the hands of coyotes. Pope Fransis said that those who have fled have left because of drug related violence, poverty, and criminal organizations. As reported by Breitbart Texas, Pope Francis has also been in Morelia, the capital of the state of Michoacan on Wednesday. The pope was speaking to citizens and young people who have lived in a country hit hard by drugs, drug smuggling, and trafficking by violent drug cartels. Michoacan has been utterly vexed with drug violence while Ciudad Juarez, Chihuahua, has earned the title of the murder capital of the world in recent years. Pope Francis I is the first Latin American pope. He was born in Buenos Aires, Argentina. As reported by Breitbart News on February 15, Republican presidential candidate Donald Trump criticized the pontiff’s stance on immigration the week before, calling him a “very political person” who is being exploited by Mexico at America’s expense. The pope has also played an important role in opening up communication between Cuba and the United States. He has addressed the United States Congress, and met with the president of Iran when the nuclear deal was under great public scrutiny. Although Official Vatican News reports that Pope Francis is in Mexico not to take a firm stance on immigration, or to be a politician, his message may not be as covert as is represented. After his trip to Cuba and the United States in September, the Pope told the international media that walls where not the solution to the migrant crisis in Europe and this was reported by Breitbart News. Pope Francis has also been a harsh critic of what he calls the “silent complicity” of the West for its failure to intervene in Syria, as reported by Breitbart News. The Pope has pointed his finger at the United States for allowing ISIS to ravage the country and their inhabitants. During his trip to the U.S., the Pope met with President Obama and Russian Premier Vladimir Putin, and the war in Syria was reported to be the number one issue discussed. “Strengthen the communion with your brothers of the North American episcopate, so that the maternal presence of the Church can keep alive the roots of the faith of these men and women, as well as the motivation for their hope and the power of their charity,” he said.